The history of First Missionary Church in rural Berne, Indiana stretches back to the late 1800s, and it has thus been a permanent fixture on the cultural landscape for even the oldest Berne residents. This rich and cherished history created tension as First Missionary Church sought to update the style of its services to retain and attract the next generation of Berne churchgoers. 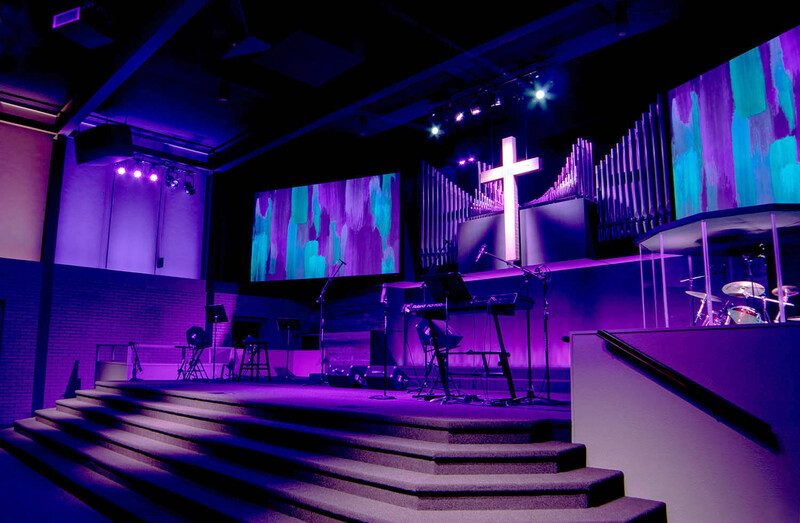 At the church’s request, A/V integration firm Custom Sound Designs (CSD) of Fort Wayne, Indiana, stepped in to offer a solution that would allow its 600-seat sanctuary to transform at the touch of a button between traditional and contemporary service styles. Integral to that solution was a new Danley Sound Labs sound reinforcement system that delivers the intelligibility and clarity required of the traditional service and the punch and volume required of the contemporary service. He continued, “The audio component was challenging because First Missionary Church has a deep, rectangular sanctuary. Part of our solution involved acoustically treating the most reflective structural elements. The rest of the solution relies on the great pattern control of Danley loudspeakers, which keeps energy on the seats and off the walls and ceiling. Moreover, Danley is famous for great definition and intelligibility, which is essential for both worship styles, and tremendous punch and SPL, which is a requirement for the contemporary services.” First Missionary Church is big on live music and has a traditional choir, piano, organ, and – point of pride – a hand bell choir. Its contemporary services rely on modern instrumentation. The sound reinforcement system CSD designed is straightforward. A left-center-right array covers most of the seating and is comprised of two Danley SH-96 loudspeakers for left and right and a Danley SH-60 loudspeaker for center. A single Danley TH-218 subwoofer provides abundant bass (when needed!). Three Danley SM-60 loudspeakers, also in a left-center-right configuration, cover a small rear balcony. A four-channel Danley DNA 20K4 Pro amplifier/DSP handles processing and amplification for the main system, and a smaller four-channel Danley DNA 5k4c amplifier/DSP handles processing and amplification for the balcony system. The church kept its existing FOH console.